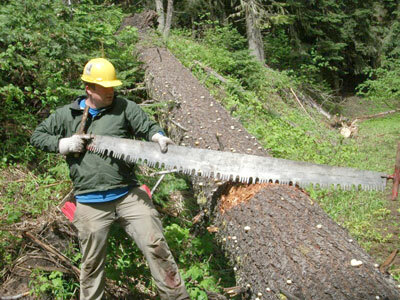 Gabe Howe, the co-found of the Siskiyou Mountain Club, uses a crosscut saw to clear a trail. The Siskiyou Mountain Club uses volunteer work crews to keep wilderness trails in the Kalmiopsis and other southwest Oregon areas open to the public. They haul their gear into the backcountry and use old-school tools to make it happen. The Kalmiopsis Wilderness is a place revered both locally and around the state for its unique beauty. Home to bright orange mountains, emerald green rivers and a botanical diversity matched by few places in the world, the Kalmiopsis is a prized destination for hikers, anglers and boaters. But since the Biscuit Fire torched virtually all 179,755 acres in 2002, the wilderness also has become a clearinghouse of tales from people who’ve struggled to navigate trails that often are in catastrophic shape. The third-largest wildfire in Oregon’s history left behind a few million dead trees that are forever falling across trails and, combined with rapid new growth, have turned some routes into tangled messes. Rather than watching the Kalmiopsis’ paths fade into memory, Howe and the SMC’s work crew of volunteers have made it their mission to keep wilderness trails open to the public. Howe, 28, founded the group with his wife, Jillian Stokes, in 2009. They incorporated as a nonprofit in 2010 and have gradually put together a group that includes 35 volunteers and works in multiple destinations throughout the Siskiyous. The work requires a different type of devotion. The Wilderness Act of 1964 prohibits use of motorized vehicles or equipment, which means SMC crews must haul their gear into camps and use tools popular during the early 1900s. Instead of a chainsaw, they use a crosscut saw. Instead of electric trimmers, they use loppers. The work can be difficult, but for some volunteers that challenge is part of the appeal. Matt Cortese, 30, came from Portland for a week of trail maintenance in the Kalmiopsis. Rohde agreed, but added that a number of different people could pitch in. Nonprofit groups such as SMC are becoming increasingly important during an age when many federal agencies are losing funding. The Forest Service and Bureau of Land Management often lack the resources to maintain wilderness trails. Which is why Howe does his best to recruit new volunteers, obtain grant money and figure out ways to stretch his resources. “The hardest thing for me is that people don’t notice when a trail is well-maintained — they just take it for granted,” he said. “It’s only when a trail is in terrible shape that people get up in arms.